PTT Research Senior Analyst Matt Margolis posted an Apple filing on Scribd in which the Cupertino firm asked the US Department of Commerce for permission to expand its sapphire production operations at its new Mesa factory. Everything looks legit, down to Apple Director of Global Trade Compliance James J. Patton's signature. The alleged request was filed on July 2 and requests an expedited review so Apple could meet an "aggressive go-live timeline of August 2014." 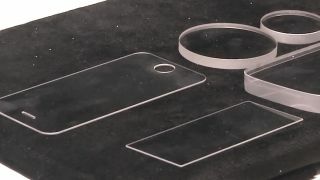 The filing goes on to make several mentions to sapphire and "jewelry" components. Adding everything up, it seems as though Apple was looking to kick start sapphire production by the beginning of this month. The newly reported documents tie closely to reports last week suggesting Apple was hoping to begin producing mass quantities of sapphire by the end of August at its GT Advanced Technologies co-operated factory. So far, we've heard many early reports pointing to the Apple introducing a sapphire screened device. Once again, there's no mention in the document what size or type of electronic we might see sapphire being incorporated in to. Jewelry components, however, is a big hint Apple is thinking iWatch here. Due to the lateness of the sapphire production it seems even less likely it will come to the iPhone 6. Assuming history repeats itself, Apple's next handset should show up at its usual September event and go on sale close to a week later. It would be nearly impossible for Apple to go from producing phones, assembling them and then launching the device into a full retail launch all within the span of a month and a half. At the same time reports have suggested sapphire is being reserved for a more expensive iPhone 6. The heavily speculated iWatch seems like a much more likely candidate to receive the sapphire screen upgrade. Luxury watches typically come with the scratch resistant material and a recent report also tipped the Apple wearable to get the sapphire treatment. Stay tuned for September 9 when we're guaranteed to at least see the iPhone 6. We wouldn't put it past Apple to slip in the iWatch too for good measure.